A great flooring for your house or office not only increases its beauty but also its value. Laminate flooring is a type of flooring that many are installing in their commercial buildings. The benefits of laminate flooring in office are many, but just like many other flooring methods, it has cons that you need to consider. This article will explore the good and the bad side of this flooring method and leave you the decision of whether or not you will install it in your office. Most people prefer to understand the good side of a product or service way before the bad side is stated. This is where the article will start. It’s the first great advantage of this flooring method. Laminate is fade resistant, scratch or impact resistant, strong and a very durable type of flooring. It consists of a resin coating and a very tough external. These properties help protect it. It’s recommended for use in high traffic areas especially one whose AC rating is not less than 3. With this floor installed in your office, you will not have to constantly change or renovate it. It’s a long term form of saving. Compared to all the other flooring methods, laminate installation is the easiest. This is because, first, it can easily be floated over many existing floor types. Unlike many others that may either need to be nailed down, stapled or glued. This aspect saves installation time. Secondly, laminate boards are usually designed to easily interlock and this makes it easy to work with them. If you are looking for a fast do it yourself project, consider laminate flooring. Also, with the current special groove-click technology, you can easily snap these laminates together and start using the floor almost immediately. This is one of the pros of this floor type that can’t just be assumed. 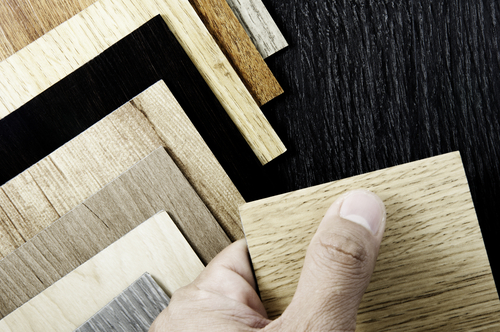 If you compare it to the traditional hardwood form of flooring, you realize it’s less expensive. Just remember that, even though it’s relatively cheap, its quality, functionality, practicability, appeal, and sustainability are all intact and perfect. Moreover, you have the option of buying a laminate flooring that fall within your budgeted price range. This floor type is available in various styles, colors, patterns, and shades. As aforementioned, it can be installed on many other subfloors. It will provide your office that great and natural look offered by real hardwood materials, ceramic materials and natural stone among others. With the EIR embossed technology, it even possible to produce a texture resembling these natural materials. Since this floor type is stain and moisture resistant, cleaning any spills on it becomes so easy. 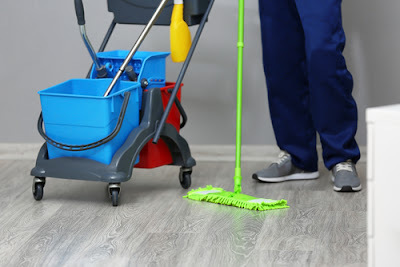 Actually, you don’t need any special cleaning solutions so as to keep your office floor in its top shape. For maintenance, just sweep it daily and you are set to go. You can also carryout weekly vacuuming if you so wish. Isn’t it an amazing way of saving on labor or chemical costs? Staying in a healthy environment is very important. If you value this aspect of life, then consider installing a laminate flooring in your office. First, this type of floor doesn’t have any spaces between its sections. This means that, debris, dust and other particles will not find any space/place to be trapped. Therefore, you are at a very low risk of suffering from any allergy related infections. Secondly, during installation of this floor, there is an underlayment done to provide a reliable moisture barrier. This aspect prevents mold growth and protects the laminate floor from being damaged. Thirdly, you may decide to treat it with anti-bacterial and allergen resistant coatings to enhance its overall safety. 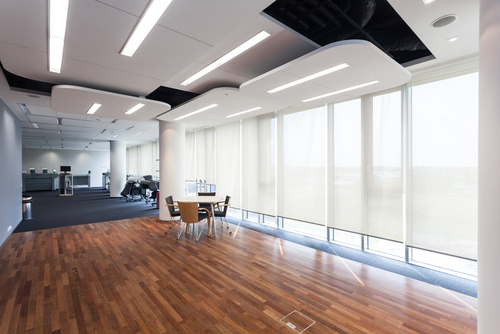 Combine these three aspects and you have a healthier office environment. Asthma as an allergy related infection is very expensive to handle. Installing this floor in your office will reduce your chances of suffering an asthma attack. Staying in a healthy environment will help save on your overall medical bills and this means you have more money to handle other issues in life. During the manufacture of laminate strips, there isn’t any endangered natural resources being used. With this, you are lowering your overall environmental footprint. To be precise, the HDF core of any standard laminate floor plank is usually made from either a post-industrial wood waste or an ecologically sustainable pine tree. The wood waste being used in the manufacture would have either been dumped in landfills or burned. Basically, if you want to give your office that great green profile, then laminate flooring is the best way out. Warranty offers any buyer some level of security during the purchase. This is because, the buyer is assured that the amount he or she has invested is protected for a stated period of time. What is important is to ensure that during the installation process, you are adhering to the terms and conditions stated in your warranty. Don’t make any mistake or you will risk losing this much needed protection. · This floor cannot be refinished and so incase the upper layer is damaged, you need to replace the affected piece. · When walking on it, it produces some hollow sound. Though this can be reduced by installing a dampening underlayment, the material will be a source of an additional cost during installation. · Though it looks natural, the feel with natural hands isn’t. · It has a limited lifespan of between 10 and 15 years. This variation comes based on the thickness and quality of materials that were used to manufacture it. As the saying goes, “information is power.” With the above details, you are fully empowered to make an informed decision about whether or not you need laminate type of flooring installed in your office. Also, if you go through all the points discussed under the benefits of laminate flooring in office, you realize that each of them has a unique way of helping you save on the amount you spend on the floor. Some are immediate while others are long term. The cons discussed above will help you understand the other side on this floor type.